As usual axlebox machining continues. Machining is also being carried out on the crown bearings for the axleboxes and the under keeps. 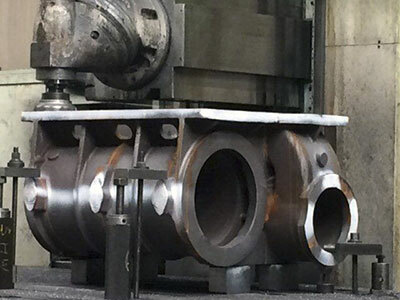 The spring link forgings are also being machined. Construction of the sandboxes is now complete and little more can be done in that area until the chassis is on its wheels. 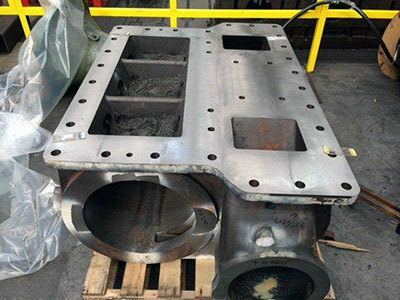 A start has been made on the vacuum and train heating pipework within the chassis. The painters on the team have worked very hard in recent weeks giving the whole chassis a repaint which we hope will catch the eye of visitors to the forthcoming SVR Autumn Gala. Our annual Tombola will be held at the SVR Autumn Steam Gala. We urgently need your help to make a success of this - all proceeds will help the 82045 boiler fund. If you can donate a gift (perfume, after shave, wine, spirits, chocolates, biscuits are popular) we will be most grateful. You can leave your gifts at Bridgnorth on Mondays or Wednesdays when team 82045 are usually to be found working on the loco or they may be brought to the gala early on the Friday. Please call or email Barbara if you wish to donate but can't deliver. Thank you! Our new 2015 calendar is now available - it is in full colour this time and costs £6.00. 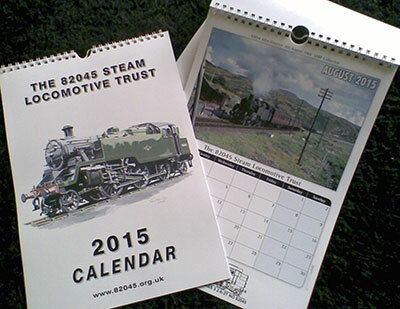 It will be on sale at the SVR Autumn Steam Gala but may also be posted to you at an extra cost of £1.20. Please send your cheque for £7.20 to Mrs. Barbara Massau, 4 Southfield, Prestbury, Cheshire SK10 4XF. We had hoped to be able to bring you news of this, accompanied by a couple of heart-stopping photographs, in this month’s updates, but, as Robbie Burns said, the best-laid plans... The week before the jump was due to take place, an exasperated Will Marsh emailed to say that the plane had broken down and the event would have to be postponed. We were just glad it didn’t break down while Will and Gary were up in it! We are now waiting for a revised date and hope to be able to give you a full report in the September notes. Money raised by the jump towards 82045’s boiler so far is around £5,000, and, if you haven’t yet been inspired to support these brave chaps, don’t forget that you still can - just send Barbara a cheque made out to The 82045 Steam Locomotive Trust and marked “Parachute Jump” on the reverse. Thanks, and watch this space! 1: Monthly standing orders, the importance of which cannot be overstated. They provide us with our financial backbone, enable us to budget accurately and amount to a really considerable income, which is increased still more by Gift Aid (see below). Please think about setting up a standing order if you haven’t already done so - Barbara or Chris will do the necessary to help you. 2: Gift Aid is payable on monetary gifts made by UK taxpayers, also on sundry cash donations. We can claim it because we are a registered charity, and it comes to us in the form of an annual payment from the Charity Commission. Gift Aid is paid at 25% of the principal, which is considerable. This means that, for example, a monthly standing order for £10-00 set up by a UK taxpayer is worth £12-50 to the Trust. Not much, you might think, but when you have a few hundred of them coming in each month it soon mounts up! 3: VAT has been transformed from a nightmare into a wonderful quarterly source of income (actually, it’s more a matter of being able to get back the 20% VAT added to the net total of every invoice paid, which had previously been a dead loss for us) since our registration last year. The Trust’s status is predicated on future steaming fees from the SVR and future hire fees to other steam railways, at which stage HMRC will also start to benefit from the arrangement. If you are as mystified by the workings of this tax as I was until my former company had to be registered for it, it amounts to a financial merry-go-round which is great if you are part of it but not so merry if you aren’t. The amount we can reclaim depends on the eligible expenditure we incur in any particular quarter. A statement is submitted by Alan Brighouse to HMRC at the end of each quarter, and repayment of VAT is usually made within about six weeks. As you know, we hope to have 82045 in steam by 2017. 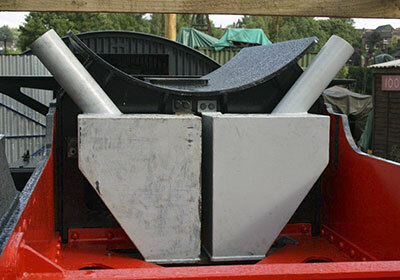 Between now and the middle of that year we have 12 quarterly VAT returns to look forward to, which should amount to a very considerable sum of money bearing in mind the major expenditure envisaged as the boiler and firebox are built. In addition to these secure income streams, we have one-off donations which may be eligible for Gift Aid (for instance, a recent donation of £5,000 generated an additional £1,250); plus the income spikes that follow each bout of publicity; plus what we can generate at special events on the SVR. (This varies considerably - keep everything crossed for decent weather during the Autumn Gala! ); plus sponsorship. The latter has proved quite successful, and is something that we will continue to offer for the remainder of the project. We have calculated that these sources of income will be enough to fund all parts of the new loco - apart from the boiler - to completion over the next three years. The big imponderables remain the pony assemblies (our secure income streams should be able to look after these), and the boiler/firebox, and we estimate that we need to raise about another £200,000, over and above what our income as outlined above will bring in, to finish the job and get 82045 on the rails and feathering at the safety valves. Many thanks to all of you who have helped us get to where we are today. Considering the stiff competition out there for funds for other new build locomotives, we have been very fortunate, and it is all down to you. For those of you who haven’t already been inspired to support us, please join the Trust and help bring this ground-breaking project to fruition as soon as possible. You have my word, as a scion of a long line of parsimonious Scottish Calvinists, that your hard-earned cash will be put to the best possible use! The right hand side rear sandbox in position. 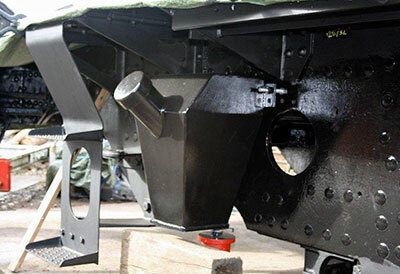 The two sandboxes, in grey primer, for the leading driving wheels.